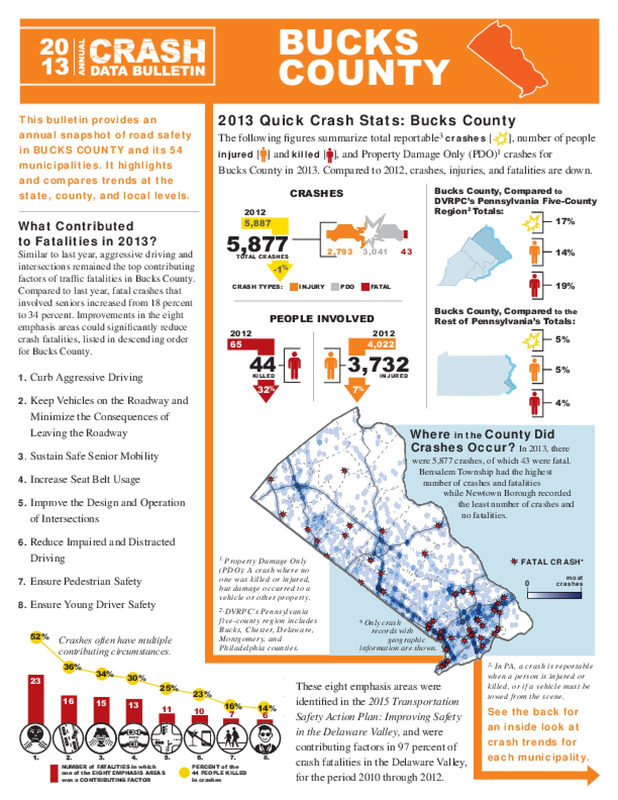 This bulletin provides an annual snapshot of road safety in Bucks County and its 54 municipalities. It highlights and compares trends at the state, county, and local levels. This document complements the 2013 Annual Crash Data Bulletin for the Delaware Valley (DVRPC Publication #15023) and is a supplement to the 2015 Transportation Safety Action Plan: Improving Transportation Safety in the Delaware Valley (DVRPC Publication #15022). Analysis in this document was derived from the PennDOT crash database unless otherwise noted. Copyright 2015 by Delaware Valley Regional Planning Commission. All rights reserved.